A ledger account (also known as T-account) consists of two sides – a left hand side and a right hand side. The left hand side is commonly referred to as debit side and the right hand side is commonly referred to as credit side. In practice, the term debit is denoted by “Dr” and the term credit is denoted by “Cr”. In the rest of the discussion we shall use the terms debit and credit rather than left and right. When a financial transaction occurs it affects at least two accounts. For example, purchase of machinery for cash is a financial transaction that increases machinery and decreases cash because machinery comes in and cash goes out of business. The increase in machinery and decrease in cash must be recorded in the machinery account and the cash account respectively. As stated earlier, every ledger account has a debit and a credit side. Now the question is that on which side the increase or decrease in an account is to be recorded. The answer lies in the learning of normal balances of accounts and the rules of debit and credit. The understanding of normal balance of accounts helps understand the rules of debit and credit easily. If the normal balance of an account is debit, we shall record any increase in that account on the debit side and any decrease on the credit side. If, on the other hand, the normal balance of an account is credit, we shall record any increase in that account on the credit side and any decrease on the debit side. Rule: An increase is recorded on the debit side and a decrease is recorded on the credit side of all asset accounts. Rule: An increase is recorded on the debit side and a decrease is recorded on the credit side of all expense accounts. Rule: An increase is recorded on the credit side and a decrease is recorded on the debit side of all liability accounts. Rule: An increase is recorded on the credit side and a decrease is recorded on the debit side of all revenue accounts. Rule: An increase is recorded on the credit side and a decrease is recorded on the debit side of all equity accounts. Normal balance: Opposite to the normal account. An example: Accounts receivable is an asset account that normally has a debit balance. The allowance for doubtful accounts is a contra account to the accounts receivable and normally has a credit (opposite) balance. Rule: If the normal balance of the contra account is debit, the increase will be recorded on the debit side and the decrease will be recorded on the credit side. 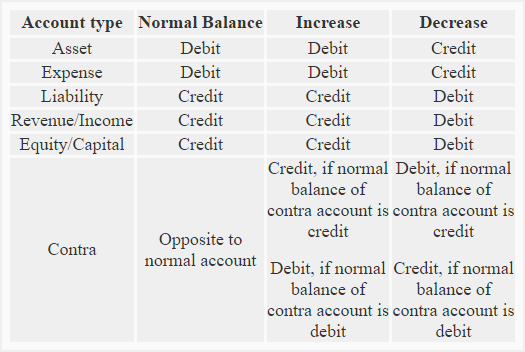 If the normal balance of the contra account is credit, the increase is recorded on the credit side and the decrease is recorded on the debit side. Started business with cash $95,000. Purchased furniture for cash $8,000. Purchased goods for cash $40,000. Purchased goods on credit from Big Traders $57,000. Sold goods for cash $5,000. Purchased equipment for business $4,000. Sold goods on credit to John Retailers $1,500. Required: Identify the accounts involved in above transactions and state the nature of each account. Also mention how increases or decreases in accounts resulting from above transactions should be recorded. i understand easily ,thank you so much. HI IF U Have more example of debit and cridit rules then plz share with. I had to understand clearly, Please send more. Too much easy and I really clear my concept. Thanks a lot clearly explained. At last, an explanation that includes all the information needed to understand the concepts: Debits, Credits. Thank you very much indeed. Especially those who presented so well with tireless labor. It is written clearly. Layman can also get a good understandability by reading this.. Thankyou indeed ! This is very helpful and i really appreciate this,thanks for the write up. Which side will be record first.example,sales on cash USD 3000,so is journalize first Dr side or Cr and why??? Thank you very much, it’s very way to understnd without tutor. I have many confusions about dr. cr. but now i’m satisfied thanks so much.